February is the time of the year when Oregonians start to experience the late stages of cabin fever. After the months of shortened days, cold temperatures, rains, and cloud cover our usually pale complexions rapidly trend toward translucence. But February also offers the first glimmers of hope of the spring ahead. By late February we start to see the cold and dreary days of winter giving way to a few sun breaks. The catkins start forming on Red Alder (Alnus rubra), and the first green leaves and white blossoms of Indian Plum (Oemleria cerasiformis) make their first appearance. Home landscapes become dappled by the ever popular crocuses and daffodils that start tempting us back outdoors. The best part of February is that even though we still have several months of wintry weather remaining, it gives us hints of spring and assures us that the worst of the season is over. This makes February the perfect time to plant new plants outside. The cool wet weather still to come helps to promote root growth of new plantings, helping keep new plantings from drying out. So if you are looking to plant, February could be the best time to get outside and cure your cabin fever. The approach often used to control invasive weeds amounts to “subtractive restoration.” We focus on the invasive species and often feel a sense of accomplishment when eradication results in bare ground without those nasty weeds. But Nature abhors bare ground and will not tolerate it for long. We hope that the surrounding vegetation will respond to fill in the gaps we have created, but if we are not careful we end up replacing our weeds with a new set of weeds. Planting or seeding disturbed areas is one of the best ways that you can help to combat this problem. Planting desirable plants is one way to control invasive weeds. One of the most common and desirable ways to combat a species like Reed Canary grass (Phalaris arundinacea) is by planting into patches with woody shrubs and trees that will eventually shade out this weed. In this way, plantings are a great tool that should be in everyone’s management toolbox. For some great tips on planting check out the Riparian Tree and Shrub Planting Guide. This February — while you are trying to figure out who first calculated the importance of a groundhog’s shadow in relation to climate — take the long President’s Day weekend to plant some plants with your valentine. 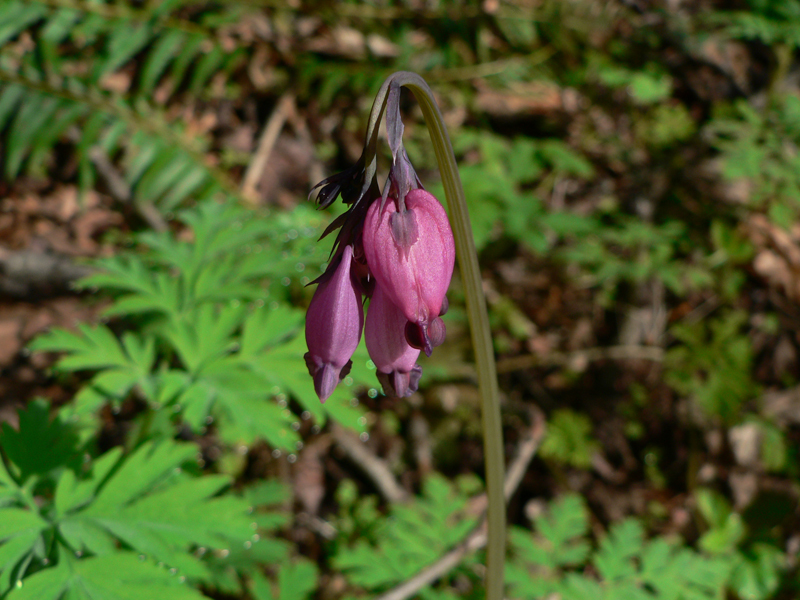 I recommend the native bleeding heart (Dicentra Formosa) to help set the mood. The little bit of time spent outside will provide the shot of vitamin D you just might need to help shake off the winter blues and cure your cabin fever. So what is up with Weeds in February? Photo is licensed under the Creative Commons Attribution-Share Alike 3.0 Unported license.